The Menil Drawing Institute, south elevation. All photos: Richard Barnes. FANTASY COLLIDED GENTLY WITH REALITY in Houston’s leafy Montrose neighborhood earlier this month. The Menil Collection is a place I have studied closely from afar but never seen in the flesh, and I was arriving with a head full of fragments: the famous centerpiece by Renzo Piano, with its cheap pine floorboards and proprietary ceiling louvers; the rows of prewar bungalows painted a uniform gray; the blocks of evergreens; the porches; the porticos; the filtered daylight. The museum of my mind wasn’t too far off, though, in part because some recent developments make the actual place more like I imagined. Plucking out an oversize apartment complex and stitching in new streets (per a new master plan), the institution has been distilling its thirty-acre campus into a purer version of itselfa carefully contrived everyday interspersed with the kind of spaces for art that architects dream about making but the Menil actually realizes. Johnston Marklee, the Los Angeles firm of architects Sharon Johnston and Mark Lee, got the chance. The completion of the Menil Drawing Institute, the freestanding facility for the study, storage, preservation, and display of works on paper that they designed, was an occasion to visit. Ever since Johnston Marklee’s design was unveiled in 2014 following an invited competition, press has latched onto the pitched profile, approving of how it seems to nod to the nearby domestic architecture. The roof is certainly the defining architectural feature of the completed buildingunifying the interior and exterior, public and private spacesbut any link to the neighbors, metaphorical or real, is fortunately weak. The collective efforts of its detailingthe cut-out corners; the contrast between the flat, white thin-plate steel outer facade and the rough, gray cedar-planked inner facadepush the building toward cool abstraction and away from symbolic reference. Johnston Marklee buildings, in general, do not wink. Their deliberate formal operations, grounded in architectural geometry and skillfully translated into material construction, feature and make strange traditional building elementsarches, vaults, apertures, and other devices for framing space and light. Perhaps this is what attracted the museum to the architects, who are best known for their residential work. Light has always had a higher calling at the Menil (its founders, Dominique and John de Menil, were Catholic, in addition to wealthy), and Piano set the bar, well, high: The sun-filtering louvers in the main building, developed together with engineer Peter Rice, breathed new life into the modern ceiling, architecture’s sorriest surface. Johnston Marklee had a different challenge. The medium for which the building was made is notoriously sensitive to light. Which means: no top-lights allowed. The architects did, midway through the design process, manage to smuggle in two narrow, floor-to-ceiling slots of glass on each end wall of the dim gallery (I suspect more for visitors’ sanity than light admittance). But even these were covered over for the inaugural exhibition, a fine show of Jasper John drawings entitled “The Condition of Being Here.” The title, taken from one of John’s sketchbooks, could be an institutional motto. Photography is not permitted in any of its galleries, some haughty fine print explains, “in order to preserve the contemplative atmosphere and facilitate intimate encounters with works of art.” Fine. But in the main building and Twombly gallery, the architecture facilitates and figures in such intimate encounters with works of art. Most dramatic of all is how, in the porous main building, glass-enclosed interior gardens afford multilayered views of artworks, tropical plants, reflections, and bodies. It’s stunning. In the drawing institute, by contrast, the relationship between the architecture as a whole and the gallery in particular is frayed. It’s jarring. Entering the exhibition space, a meticulous shell of sheetrock strewn with spotlights, I felt like I had crossed a sanitary line, one that divided invention and delight from prescriptive best-practices. View of Jasper Johns’s “The Condition of Being Here,” 2018. Then I took a step back and remembered I was in an institute, with all the empiricism and serious quasi-scientific rigor that the self-conscious term implies. This fact, not the photosensitivity of paper, is what distinguishes the building from the others on the Menil campus. The exhibition of artworks is simply not the priority of the MDI. 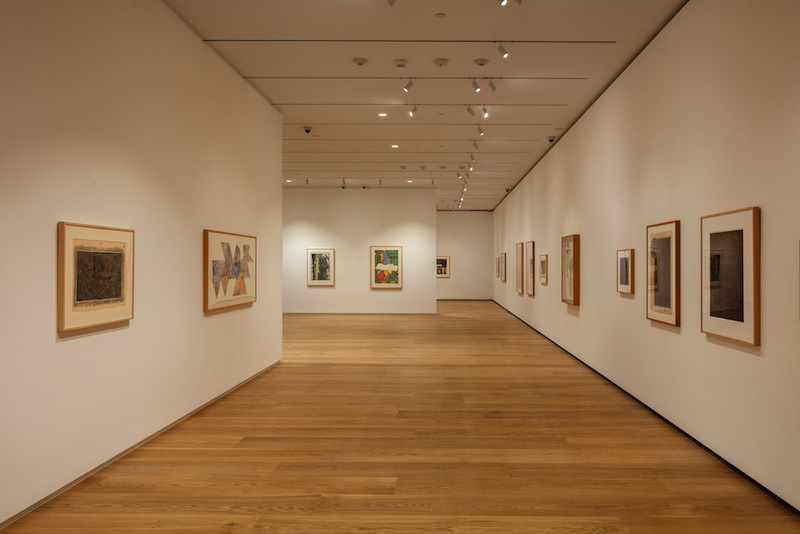 This is not a criticism, just a statistic: The gallery accounts for just under ten percent of the building’s total thirty-thousand square feet. Scholars will get the most out of it, and I envy their spacestheir cloister, study room, collection access, and staff support. The rest of us have the entrance courtyards and living room, terrific areas that alone are a reason to visit. Cliché as it sounds, the transitional is the destination here. One more way to look at this project is biographically. 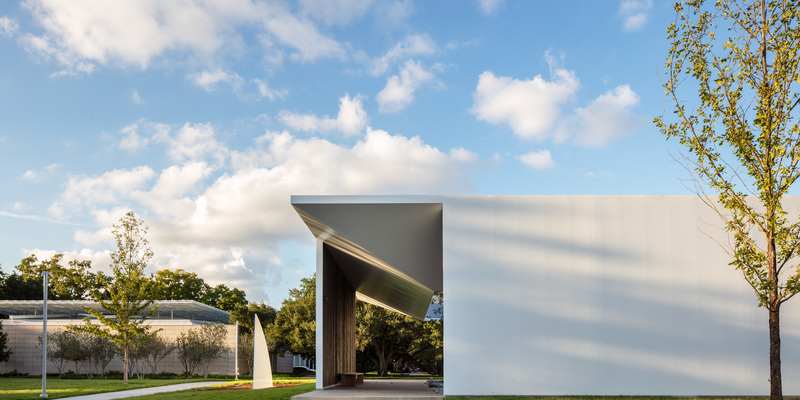 The MDI is the museum’s first building for art not conceived during Dominique de Menil’s lifetime (she died in 1997, aged 89). Her smart, hands-on patronage, which extended to active participation in the architectural design process, is one reason why the idea of a perfect client persists even as the myth of the genius architect is thoroughly eroded. Great buildings require great clients, consensus still goes. If her vision still informs the institution, it is filtered through deadening bureaucratic instruments: executive leadership and the board of trustees. The Menil remains an exceptional institution, for sure, but it is necessarily more like other art museums today than in prior eras, and the MDI is a reflection of this. The drawing institute has the burden of cleaning up after past commissions (Piano’s light spills too freely), but overall it proceeds with too much caution. The de Menils, under the influence of French Dominican priest Father Marie-Alain Couturier, aspired to make spaces in which poetry would prevail over pedagogy. Yet with the drawing institute, the Menil has provided a lesson: In hewing to too strict an idea of verse, it left some of the talent of its architects on the table. David Huber is a writer living in the Midwest.